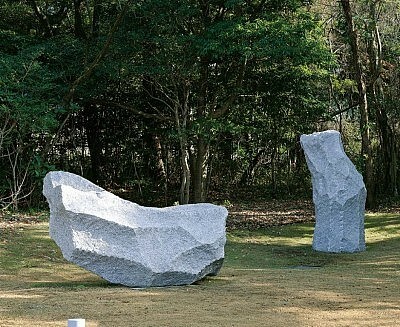 The rough surface resulting from splitting a rock and the shape that results by chance have been preserved here，resulting in solid forms filled with vibrant energy. The two whitish pieces of granite have a forcefulness that takes us to the depths of nature. Could this be because the granite comes from a coastline washed by the waves of the Pacific?